Since there are so many different WordPress development firms, it can sometimes be hard to pick the right one. WPDance is certainly a good choice, regardless of what niche you are looking for. Read on for a thorough description of what WPDance has to offer. WPDance is a WordPress theme developer that has been in the business for years. 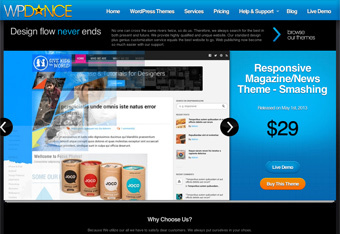 They offer a variety of different WordPress themes in various niches. Besides restaurant themes for WordPress you will also find themes at WPDance that fit just about every niche, as well as several generic themes that could be used for a variety of businesses and websites. WPDance has maintained a very good balance between visual aesthetics and theme functionality. While some of their competitions tend to chose one or the other, WPDance works hard to make visually appealing themes that are also highly functional. Plus, they focus on making their themes as easy to setup and use as possible, making it easy for beginners to build great websites. WPDance is so confident that you’ll love their products that they offer a no-questions-asked 7 day return policy. So, if you buy a theme and end up not liking it, you can return it for a full refund, no questions asked. This is a rare guarantee in this industry. Plus, WPDance is much more than just a developer of WordPress content and restaurant themes for WordPress – they are a one-stop-shop for your web development needs. Offering services such as WordPress theme conversion (converting your Photoshop files to working, coded themes), WordPress installation, WordPress add-on development, WordPress server optimization, and more, WPDance is an excellent resource for business owners looking to establish or expand their web presence.